Get this year’s “New England Review” at last year’s price! There’s no better time to subscribe to Middlebury’s literary quarterly, New England Review—or renew! From now until January 31, get this year’s writing at last year’s price. Now just $30 for a full year of the always thought-provoking, often beautiful, and reliably wide-ranging new writing our readers have come to count on. Delivered to you four times a year. Click here to purchase your print and digital editions. This entry was posted in Midd Blogosphere and tagged For Faculty, For Staff on January 25, 2016 by CK. New England Review – on sale for the holidays! To celebrate the season, New England Review is pleased to make a special holiday offer to the Middlebury College community. From now until the new year, Midd students, faculty, and staff may purchase one-year subscriptions (that’s four issues) for only $20, and receive the current issue free. Subscribe now, so you can start your gift subscription in time for the holidays—a perfect last-minute gift for the readers on your list. You’re welcome to pick up your free current issue here in the office—we’re located at 204 College Street, Apt. A—or we can send it through campus mail before the holiday break. Copies are also available for purchase in the college bookstore and the Vermont Book Shop. To learn more about NER, please visit our website. Credit card orders can be made by calling the NER office at ext. 5075 (Visa or Mastercard only), dropping by our office, or online through the College Bookstore (use the discount code SPCNER in the space indicated). You may also send your order with payment by check to New England Review, Middlebury College, Middlebury VT 05753. We look forward to hearing from you! This entry was posted in Midd Blogosphere and tagged For Faculty, For Staff, MiddPoints on December 9, 2013 by CK. To celebrate the season, New England Review is pleased to make a special holiday offer to the Middlebury College community. From now until the new year, Midd students, faculty, and staff may purchase one-year subscriptions only $20, and receive the current issue free. Credit card orders can be made by calling the NER office at ext. 5075 (Visa or Mastercard only) or on our secure order form on our website (use the discount code SPCNER in the space indicated). 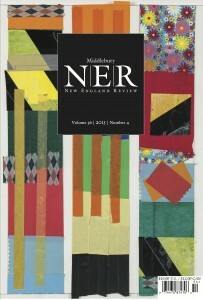 You may also send your order with payment by check to New England Review, Middlebury College, Middlebury VT 05753. We look forward to hearing from you! This entry was posted in Midd Blogosphere and tagged For Faculty, For Staff on December 6, 2012 by CK. The New England Review is pleased to present a special Valentine’s Day edition of the NER Vermont Reading Series, “Will Write for Love,” with eight Addison County poets and fiction writers: Jennifer Bates, Maya Beres, Karin Gottshall, Carolyn Kuebler, Christopher Ross, Jeffrey Stauch, Karla Van Vliet, and David Weinstock. The event takes place at Carol’s Hungry Mind Cafe, 24 Merchants Row in Middlebury, at 7 p.m., on February 14. This entry was posted in Midd Blogosphere and tagged fiction, For Faculty, For Staff, New England Review, poetry on February 5, 2012 by CK. Middlebury’s literary quarterly, New England Review, is pleased to present the next event in its quarterly Vermont Reading Series. Stephen Kiernan, Chloe Joan Lopez, Daniel Lusk, and Neil Shepard will read from their poetry and fiction, on Thursday, January 19, at 7 p.m., at Carol’s Hungry Mind Café, 24 Merchants Row, in downtown Middlebury. This entry was posted in Midd Blogosphere and tagged For Faculty, For Staff on January 15, 2012 by CK. To celebrate the season, New England Review is pleased to make a special holiday offer to the Middlebury College community. From now until the new year, Midd students, faculty, and staff may purchase one-year subscriptions to NER for only $20, and receive the current issue free. Subscribe now to start your gift subscription in time for the holidays—a perfect last-minute gift for the readers on your list. You can pick up your free current issue in the NER office at the Kirk Center, or it can be sent to you through campus mail before the holiday break. Copies are also available for purchase in the college bookstore and at the Vermont Book Shop. To sample the contents of NER online and read more about this publication, please visit http://www.nereview.com . Credit card orders can be made by calling the NER office at ext. 5075 (Visa or Mastercard only) or on the secure web order form <https://web.middlebury.edu/forms/nereview/order_form.php> (use the discount code SPCNER in the space indicated). You may also send your order with payment by check to New England Review, Kirk, Second Floor. This entry was posted in Midd Blogosphere and tagged For Faculty, For Staff on December 1, 2011 by CK. This entry was posted in Midd Blogosphere and tagged Uncategorized on July 25, 2011 by CK.